Originally, the formed loaves were placed on metal sheets and then into wheeled metal bakery cabinets for freezing. As orders were filled, the cabinets went from the freezer directly into trucks and were shipped. This depleted the number of cabinets available onsite for the next day’s bread, which became a critical problem as production increased. In addition, the cabinets had to be thoroughly washed down between uses, adding labor cost to the operation and slowing productivity. As the restaurant chain continued to grow and order volume increased, this became a major problem. The company decided to change its storage and shipping process by replacing the cabinets with individual plastic bread trays that, after filling, were placed on one another to form stacks. These stacks reach heights of from 60 to 80 inches and rest on wheeled bases that allow them to be moved around the facility and into trucks with minimal effort. 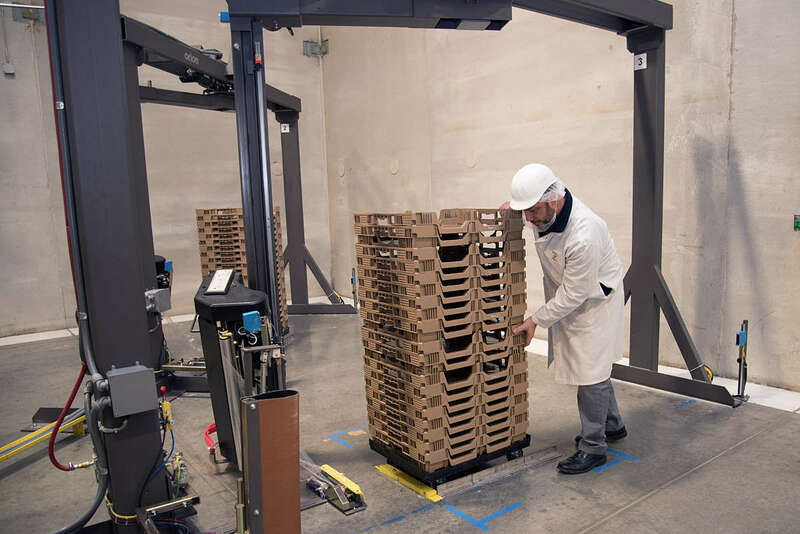 The next challenge was how to securely ship the stacked trays, since the stacked trays—even the highest stacks—were much lighter than the previous cabinets and could be tipped either while being moved around the facility or by the movement of the truck during shipment. The solution was to wrap the stacked trays with stretch film, much as many operations wrap pallets before shipment. Once the trays were stacked to the desired height, the stacks were wrapped by hand with one layer of stretch film. This proved sufficient to stabilize the stack and provide more effective protection for the loaves from dust and dirt. Unfortunately, hand-wrapping the stacks was labor-intensive and time consuming, and it was difficult to maintain the throughput needed to meet the increasing restaurant demand. 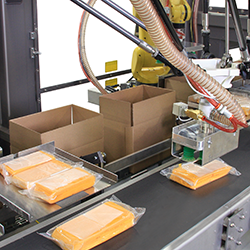 For advice on how to speed things up, the facility consulted Shamrock Packaging Group, Chicago area distributors of packaging equipment and materials, as well as another distributor. Shamrock, in turn, contacted Orion, a member of the ProMach End-of-Line packaging group and a specialist in stretchwrapping loads to prepare them for safe storage and shipment, and the two worked together to provide a solution. After assessing the facility’s operation, the Orion specialists developed several options. The first involved conveying the stacks to a conveyor that would move them into than automatic wrapping zone where they would be securely wrapped with stretch film. This suggestion was beyond the company’s budget, and also could deliver only 90 wrapped stacks per hour, not the company’s projected throughput of 120 loads per hour. The innovative solution that has met both the company’s budget and required production speed requirements is a set of three Orion RTA (Rotary Tower Automatic) rotating arm automatic wrappers. 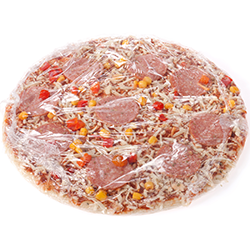 The wrappers are arranged in a triangular format in an area of the facility between the freezer and the truck loading doors. Even without the use of powered conveyors, this arrangement is able to efficiently meet the company’s throughput productivity needs. Stacks of trays are rolled into position in a clearly marked position at each wrapper. Operators then activate the wrapper controls on the HMI of each unit, located on the other side of a protective fence from the wrappers. The system is flexible, and can wrap one, two or all three of the loads, depending on what is needed and which of the HMIs the operator activates. For further personnel safety, photoelectric eyes create a beam that will stop the wrapping process if the beam is crossed and broken. The start process resets each system’s controls and readies the RTAs for wrapping. The operator then initiates the wrap using the HMI that controls the three integrated systems. The three stacks are wrapped within one minute. They are then moved off to the loading docks, and the next three stacks moved into position. 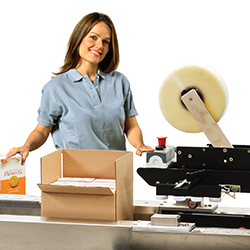 The RTA wrapper’s automatic features facilitate a fast wrap by eliminating manual operations. The film tail does not need to be manually attached to the stack being wrapped, for example; the RTA attaches the film tail to the load and also cuts and secures it at the end of the cycle. Manual operations are limited to placing the stacks in position and moving them to the dock following wrapping. The RTA units installed in the facility also incorporate precision ring bearings with heavy chains, which support and drive their rotating arms. These ring bearings provide superior wear life over traditional bearings, and deliver precise wrapping throughout the facility’s demanding, continuous wrapping operation. 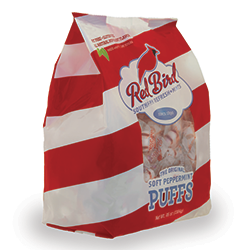 This three-unit wrapper system was designed to wrap 100 loads per hour, the company’s target throughput. Following installation and initial trials, it was found that that number could be 120 loads on a regular basis, and beyond that when needed. In one recent four-hour shift, for instance, 580 loads were wrapped. Given their instability, the stacked trays cannot be wrapped with the film tension and arm speed level that a typical pallet load is wrapped with, since the tension might actually contribute to toppling the stack. The RTA has adjustable film tension and corner compensation that allows the film to be applied with very low tension. The wrap on the stacks is relatively loose, and is only one layer, keeping the stacks integrated and covering them to keep the loaves clean. This is something that hand wrapping had not been able to do consistently. In addition, the film delivery system on the RTA provides the wrappers with 260 percent pre-stretch film. This pre-stretch not only makes the film stronger and more puncture resistant, it also dramatically reduces the amount of film used on each load compared to hand wrapping. That saving, plus reduced wrapping labor costs and increased productivity, and elimination of the labor cost and time needed to washdown cabinets (20 minutes each), has made the new system very cost-effective. In addition, since the bakery no longer has to await the return of cabinets to begin loading them, wrapped loads can be waiting to be loaded into trucks when they return, further increasing throughput. As a result of this new end-of-line capability, the facility has been able to easily fill the daily orders received from restaurants in one evening shift, and expects to be able to handle seasonal increases in volume. Facility managers also feel comfortable with having the potential to handle any increased future demand resulting from company expansion. The company is very pleased with that result, so much so that a similar project is currently being considered for its California regional facility.